On this Thursday of Borrowed Words, I am pleased to share with you a summary of Harvey Newcomb's Guide to Bible Study (1800's). Read the Bible in your closet or under circumstances which will secure you from interruption, either by the conversation of others, or the attraction of other objects. Do not attempt to fill up little broken intervals of time with the reading of God’s Word. Leave these seasons for lighter reading. 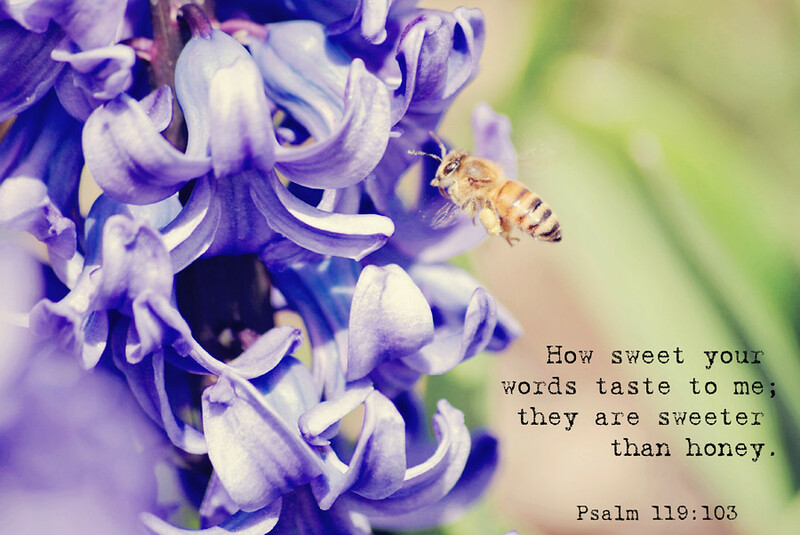 Reading the Scriptures is conversing with God, who speaks to us when we read His holy Word. His all-seeing eye rests upon our hearts; and He knows whether we are engaged in solemn trifling. If we read His Word so carelessly as not to understand its meaning and drink in its spirit, we treat Him as we would disdain to be treated by an earthly friend. Let us, then, never approach the Word of God but with feelings of reverence and godly fear. Go to the Word of God with a preparation of heart. If we were going to visit some person of great importance, whose favor and esteem we wished to secure, we would take care to have everything about our persons adjusted in the most fitting manner. So let it be with our minds when we come to converse with God. Let us shut out all worldly thoughts and strive to secure a tranquil, holy, and tender frame, so that the truths we contemplate may make their proper impression upon our hearts. Christ promised His disciples that, when the Holy Spirit would come, He would "guide you into all truth" (John 16:13). Without His enlightening influences, we cannot understand the Word of God. And without His gracious influences, we shall not be disposed to obey it. But we have the most abundant encouragement to seek the aid of this divine Instructor. Christ assures us that God is more willing to give His Holy Spirit to those who ask Him, than earthly parents are to give good gifts to their children (Mat 7:11). Before opening God’s Word, therefore, we should pray that He would show us the truth, the rule of our duty, and incline our hearts to obey it; and, as we proceed, keep our hearts silently lifted up to God for the same object. Whenever you have discovered any truth, ask what bearing it has upon present duty. If it relates to spiritual affections, compare with it the state of your own heart. If it relates to the spirit and temper of Christians, in their fellowship with one another, or with the world, compare it with your own conduct. If it relates to some positive duty, inquire whether you have done it. And, wherever you find yourself deficient, endeavor to exercise repentance, and seek for pardon through the blood of Christ with grace to enable you to correct what is wrong. A daily supply of refreshment is no less necessary for the soul than for the body. The Word of God is the bread of eternal life, "the food of the soul." Take, then, your regular supplies that your soul may not famish. Choose for this purpose those seasons when you are least liable to interruption—when you can retire and shut out the world, when you can best command the energies of your mind. There is no time more fit and suitable for this than the morning. Then the mind is clear, vigorous, unencumbered, and prepared to receive impressions. There is also a propriety in consulting God’s Word at the close of the day. But this depends much on the state of the body. If you become exhausted and dull after the labors of the day, I would rather recommend taking the whole time in the morning. But by no means confine yourself to these stated seasons. Whenever the nature of your pursuits will admit of your seclusion for a sufficient length of time to fix your mind upon the truth, you may freely drink from this never-failing fountain the water of life. Keep before your mind the grand design of the Scriptures, which is to convince mankind of their lost and ruined condition, make known the way of salvation, and persuade them to embrace it. (1.) Endeavor to become acquainted with the peculiarity of each writer’s style. Although the Scriptures were dictated by the Holy Spirit, yet it was so done that each writer employed a style and manner peculiar to himself. This does not invalidate the evidence of their divine origin, but rather shows the wisdom of the Spirit. If the whole Bible had been written in a uniform style, it would have given opponents a strong argument against its authenticity. The lack of that uniformity furnishes conclusive evidence that it could not have been the work of a single impostor. Again, a continued sameness of style would make the reading of so large a book as the Bible tedious and unpleasant, but the rich variety presented by the various authors of this blessed book helps our infirmities and makes the reading of it pleasing and delightful. (2.) Inquire into the character, situation, and office of the writer; the time, place, and occasion of his writing; and the people for whose immediate use he intended his work. This will enable you to understand his allusions to particular circumstances and customs, and to see the practical application of the principles he advances. (3.) Consider the principal scope or aim of the book, or what was the author’s object, design, or intention in writing it. Notice also the general plan or method, which he has pursued. This will enable you to discover his leading ideas, if it be an argumentative work, or the particular instructions of God’s providence, if it be historical. (4.) Where the language is difficult to be understood, pay strict attention to the context, and you will generally find the author’s meaning explained. But, if not, consider whether the difficult phrase is a peculiarity of the writer’s style. If so, look out the place where he has used it in a different connection, and see what meaning is attached to it there. But if this does not satisfy you, examine the passages in other parts of the Scriptures which relate to the same subject, and compare them with the one under consideration. This will generally clear up the darkest passages. But if you still feel in doubt, you may find assistance from consulting commentators who have made themselves acquainted with the particulars I have mentioned; which, with a knowledge of the language in which the book was originally written, may have enabled them to remove the difficulty. But in reading commentaries, always bear in mind that they are the productions of fallible men, whose opinions are not to be taken for Scripture. You may, however, avail yourself of their knowledge, without submitting your mind implicitly to their judgment. This you will be compelled to do because on many points, they differ in opinion. Do not task yourself with a certain quantity of reading at the regular seasons devoted to the study of the Bible. This may lead you to hurry over it, without ascertaining its meaning or drinking into its spirit. You had better study one verse thoroughly, than to read half a dozen chapters carelessly. The nourishment received from food depends less on the quantity, than on its being perfectly digested. So with the mind: one clear idea is better than a dozen confused ones. And the mind, as well as the stomach, may be overloaded with undigested food. Ponder upon every portion you read, until you get a full and clear view of the truth that it teaches. Fix your mind and heart upon it, as the bee lights upon the flower, and do not leave it until you have extracted the honey it contains. Before beginning the study of a book, you ought to take an opportunity to read the whole of it rapidly at one sitting, in order to learn the author’s scope and design. You will find this a profitable practice whenever you have time for it. You will be especially interested to review, in this way, the books you have studied. The more thoroughly they have been studied, the more deeply will you be interested in the review. You will find great advantage from the use of a reference Bible and concordance. By looking out the parallel passages, as you proceed, you will see how one part of the Scriptures explains another and how beautifully they all harmonize. In reading the Scriptures, there are some subjects of inquiry, which you should carry along with you constantly. (1.) What do I find here which points to Christ? Unless you keep this before your mind, you will lose half the interest of many parts of the Old Testament, and much of it will appear to be almost without meaning. It is full of types and prophecies relating to Christ, which by themselves appear dry, but when understood are most beautiful and full of instruction. (2.) The Bible contains a history of the church. Endeavor then to learn the state of the church at the time of which you are reading. (3.) Inquire what doctrinal truth is taught, illustrated, or enforced in the passage you are reading and what principle is recognized. Great and important principles of the divine government and of practical duty are often implied in a passage of history, which relates to a comparatively unimportant event. Let it be your business to draw out these principles and apply them to practice. Thus, you will be daily increasing your knowledge of the great system of divine truth. (4.) Note every promise and every prediction. Observe God’s faithfulness in keeping His promises and fulfilling His prophecies. This will tend to strengthen your faith. You will find it profitable, as you proceed, to take notes of these several matters particularly. At the close of every book, review your notes and sum them up under different heads. Read the Gospels with great care for the purpose of studying the character of the blessed Jesus. Dwell upon every action of His life and inquire after His motives. By this course, you will be surprised to find the Godhead shining through the manhood in little incidents, which you have often read without interest. Look upon Him at all times in His true character, as Mediator between God and man. Observe His several offices of Prophet, Priest, and King. See in which of these characters He is acting at different times, and inquire what bearing the particular action you are considering has upon His mediatorial character. Observe also the particular traits of character which appear conspicuous in particular actions—such as power, energy, manly hardihood, dignity, condescension, humility, love, meekness, pity, compassion, tenderness, forgiveness, etc. Take notes, and when you have finished the course, draw from them, in writing a minute and particular description of His character. This will be of great service to you as a pattern. You will also, by this means see a peculiar beauty and fitness in Christ for the office He has undertaken, which you would not otherwise have discovered. But do not stop with going through this course once. Repeat it as often as you can consistently with your plan of a systematic study of the Holy Scriptures. You will always find something new, and upon every fresh discovery you can revise your old notes. In reading the historical and biographical parts of Scripture, observe the following. (1.) The histories contained in the Bible are the histories of God’s providence. Notice His hand in every event, and inquire what principle or law of His moral government is exemplified, carefully observing its application to nations, communities, and individuals. (2.) When you read of particular mercies or judgments, look back for the cause. In this way, you may discover the principles on which God administers His most holy, wise, and just government. (3.) In the biographies of the Bible, study the motives and conduct of the characters described. If they are unconverted men, you will learn the workings of human depravity, and discover what influence a correct religious public sentiment has in restraining that depravity. If they are good men, you will see in their good actions living illustrations of the great doctrines of the Bible. Endeavor to learn by what means they made such attainments in holiness, and strive to imitate them. If any of their actions are bad, look back and inquire into the cause of their backslidings. If you discover it, you will find a way-mark to caution you against falling into the same pit. The poetical and didactic parts of the Scriptures are scattered throughout the whole Bible. These abound with highly wrought figures. This is probably owing partly to the insufficiency of ordinary language to express the lofty and sublime ideas presented to the minds of the writers by the Spirit of truth, and partly to the method of communicating ideas which always prevails in the infancy of language. Endeavor to understand the figures used. They are often taken from prevailing habits and customs, and from circumstances peculiar to the countries where the Scriptures were written. These habits and circumstances you must understand, or you will not see the force of the allusions. Others are taken from circumstances peculiar to particular occupations in life. These must also be thoroughly studied, in order to be understood. But where the figures are drawn from things perfectly familiar, you will not perceive their surprising beauty and exact fitness to express the idea of the sacred penman, until you have carefully studied them and noted the minutest circumstances. Beware, however, that you do not carry out these figures so far as to lead you into fanciful and visionary interpretations. The books of the prophets consist of reproofs, exhortations, warnings, threatenings, predictions, and promises. By carefully studying the circumstances and characters of those for whom they were written, you will find the principles and laws of God’s government set forth, in their application to nations, communities, and individuals. From these you may draw practical rules of duty, and also learn how to view the hand of God in His providence in different ages of the world. The predictions contained in these books are the most difficult to be understood of any part of the Bible. You will find it an interesting and profitable employment, occasionally to read a given book through, for the purpose of seeing what light it throws upon some particular point of Christian doctrine, duty, practice, or character. For example, go through with Acts with your eye upon the doctrine of Christ’s divinity. Then go through with it a second time, to see what light it throws on the subject of Revivals of Religion. Pursue the same course with other books and in respect to other subjects. In this way, you will sometimes be surprised to find how much you have overlooked in your previous reading. The foregoing suggestions may appear formidable because of the time and study requisite to carry them into execution. But it is to be remembered that the young Christian has his lifetime before him, and that his great business is to obtain a knowledge of divine things. The plan is not sketched with the expectation that everything here recommended will be accomplished in a single year, but with the view of laying out business for life.